Born on 10th September 1913 in the Hessian city of Kassel, Heinrich Kling joined the SS in 1932 just short of his nineteenth birthday. Assigned to the 7. Standarte “Germania” in Arolsen, he started to climb through the non-commissioned rankk, and by 1937 had reached the rank of SS-Scharführer. 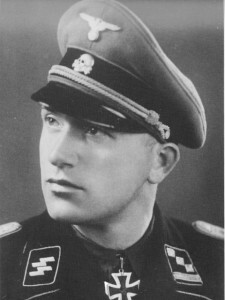 Identified as a potential officer candidate, Kling took his place at the SS-Junkerschule Bad Tölz in 1938. On 9th November 1938 Kling had graduated from the Junkerschule and obtained his commission. Having initially been assigned to the 10th Company of the Standarte “Germania”, he was assigned to the 6th Company of the 12th SS-Totenkopfstandarte in 1939. The unit was involved in anti-partisan duties in western Poland in late 1939 and early 1940, though there is little information on what Kling’s involvement actually was. By the end of 1940, he had already been promoted to SS-Obersturmbannführer and awarded both the Iron Cross 2nd Class and the War Merit Cross with swords. At the end of 1940, some units of the SS-Totenkopfstandarte were incorporated into the expanding Leibstandarte Adolf Hitler. Kling by this time was the commander of the 1st Company of the 5th SS-Totenkopf Infanterie Regiment based in Wischau (Vyškov) near Brünn (Brno) in Moravia. It was a fortuitous move. The 5th Totenkopf was re-purposed as the 18th Company of the 4th Battalion of the Leibstandarte, and Kling was now part of the most elite formation in the rapidly-developing Waffen-SS. Kling was assigned to his new unit in time for the invasion of the Soviet Union in May 1941. He was wounded twice and awarded the Iron Cross 1st Class that summer, and had moved to the Panzers by 1942 after a short stint in the SS-Panzer Replacement Battalion. At the end of the year Kling, now an SS-Hauptsturmführer in the 2nd Battalion of the LSSAH, had joined Michael Wittmann in the 4th (Heavy) Company. As company commander, Kling was assigned the lead Tiger 405. Meanwhile, SS-Untersturmführer Michael Wittmann, fresh from the officer production line at Bad Tölz, had been assigned to the the IVth (Light) Platoon, commanding a Panzer III. When the unit was redesignated as the 13th (Heavy) Company, Kling was still commander and Wittmann had his own Tiger I in the 3rd platoon. The Ostfront campaign of 1943 saw Kling wounded twice, earning him the Verwundetenabzeichen in silver and then gold. Having returned to the front at the end of 1943 he was awarded the German Cross in Gold, and in January 1944 he was recommended for the Ritterkreuz. He was presented with the award on 23rd February, a month after Wittmann had received his. Kling was heavily involved in the reformation of the 13th (Heavy) Company and its upgrading to battalion strength during the spring of 1944. By the end of June he had been promoted to SS-Sturmbannführer, and given command of the newly formed Schwere SS-Panzer-Abteilung 101 – 101st (Heavy) SS Panzer Battalion. With Kling’s promotion to battalion commander, Wittmann, now an SS-Hauptsturmführer, assumed command of the 2nd Company. Heinz von Westernhagen had been appointed as battalion commander, but injuries sustained during the Kursk offensive meant that Kling was effectively in charge of the unit. Following Westernhagen’s removal from command and subsequent death in March 1945, Kling was appointed formally – a role he fulfilled until the end of the war. By then, the 101st had been redesignated as the 501st (Heavy) SS Panzer Battalion and provided with newer Tiger II tanks. Heinz Kling survived the war, but died at the age of thirty-eight on 30th September 1951, having drowned at Lake Constance (Bodensee). No reason was provided for his death.